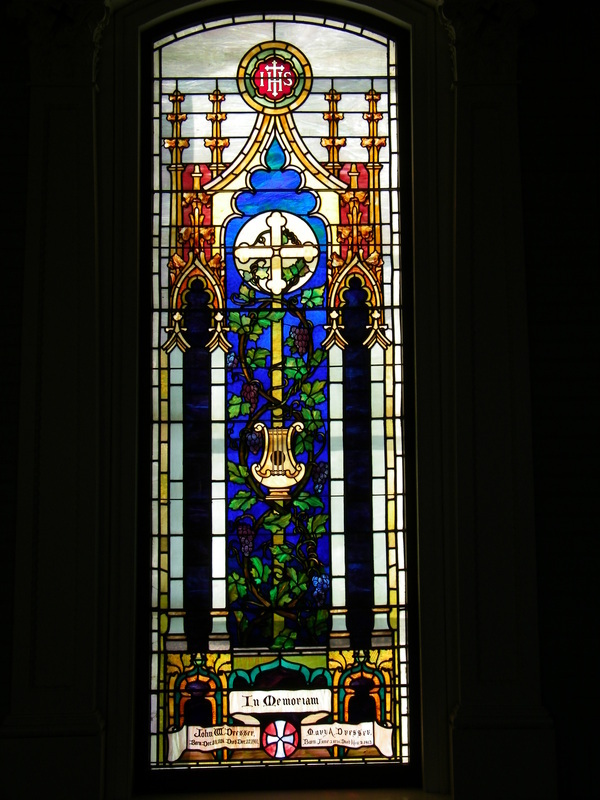 On any sunny day, the stained glass windows at the Trinitarian Congregational Parish cast a warm glow on the sacred space that is our sanctuary. Each of these windows holds a story, not only of religious symbols and icons, but also of the people to whom the windows were dedicated. These stories have been compiled by Carolyn Brouillard, and are reproduced here for this tour. Contact the church for a special commemorative booklet containing these and other historic photos of the church and historic Castine. Note: Click on each photo to see a larger photo in a different window. Born 1798 in Woodstock, Vermont, Squire Hezekiah Williams graduated from Dartmouth College in 1820, and settled in Castine in 1825. In May of the next year, he married Eliza Patterson of Belfast. they lived in the house right below the church on the corner of Court and Main Street. They had four sons and four daughters. Their daughter Lucia fell in love with Lemuel Atherton, a brilliant young lawyer who lived on the corner across Court Street. When her father didn’t approve, she “took to her bed” until he gave in. They happily married and moved to Dixon, Illinois, where he became the mayor. 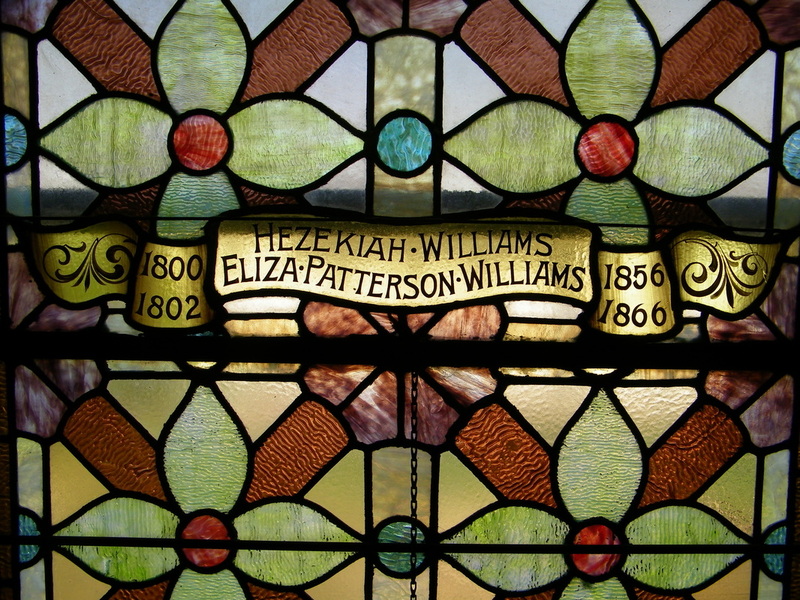 When Hezekiah Williams died in 1856 the rest of the family moved to Illinois. In 1832 Williams was appointed to the Board of Health when cholera was prevalent in this country. The board established a quarantine for all vessels, inspected every house in town, and compelled the removal of all “nuisances and filth.” The measures taken were effectual, since no cholera cases occurred here as had happened in some other coastal towns. Although a respected member of the Hancock Bar, Williams was more extensively known in political rather than professional circles. He held, at different times, various offices of honor and trust in town and state. In 1845-47 he represented this district in Congress. He belonged to the Democratic Party. Mr. Williams was a prominent and zealous member of the Masonic Order. At one time he was the Master of the Hancock Lodge, and in 1841 he was elected Grand Master of the Grand Lodge of Maine. Hezekiah Williams died in Castine on October 1856, aged 58 years and 13 days. His wife died 1866 and her remains were brought back from Illinois and are interred in the Castine Cemetery. 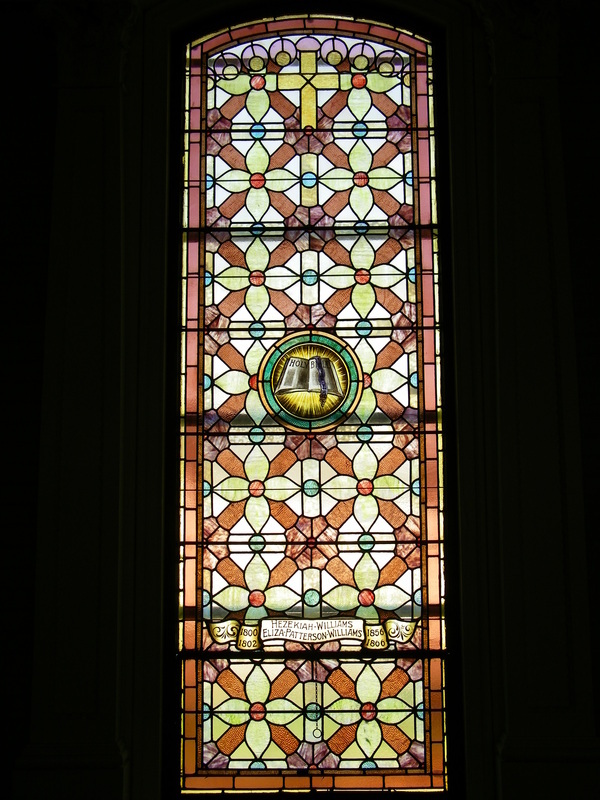 Detail of the Williams window. 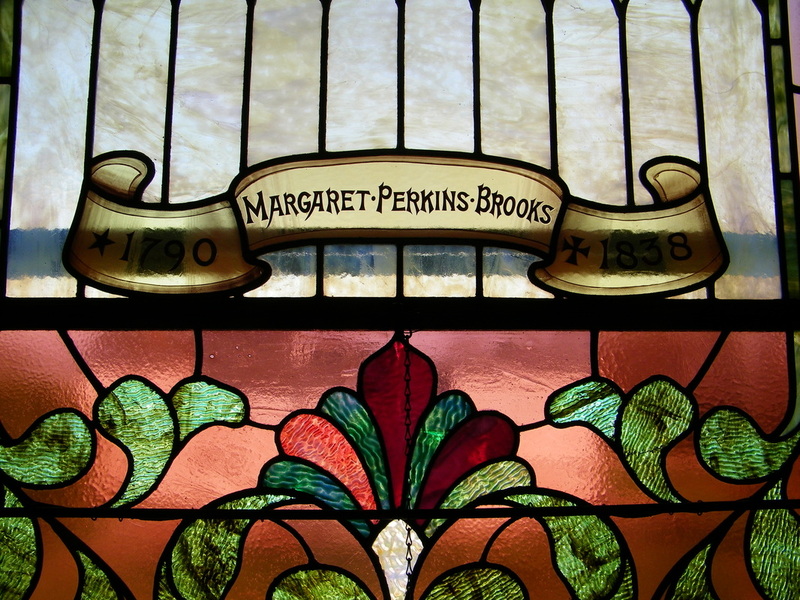 Margaret Perkins Brooks was born in 1790. Her parents, Joseph and Phebe, were considered wealthy for the time and had a large house on upper Main Street. Margaret was 24 when the British occupied Castine in the winter of 1814 -15. She married Captain Barker Brooks of Massachusetts a year or so later. He established a shipyard in Camden in 1806 and probably had a business in Castine at that time as well. they had eight children. Margaret died when their son Noah, the youngest, was seven. Their house is still on the common in Castine, at the top next to the Adams School, and is referred to as the Gardner house. Noah became a famous writer. He published stories about growing up in Castine, among his other fine works. Noah became a close acquaintance of Abraham Lincoln, and was a frequent visitor to the White House. Rev. 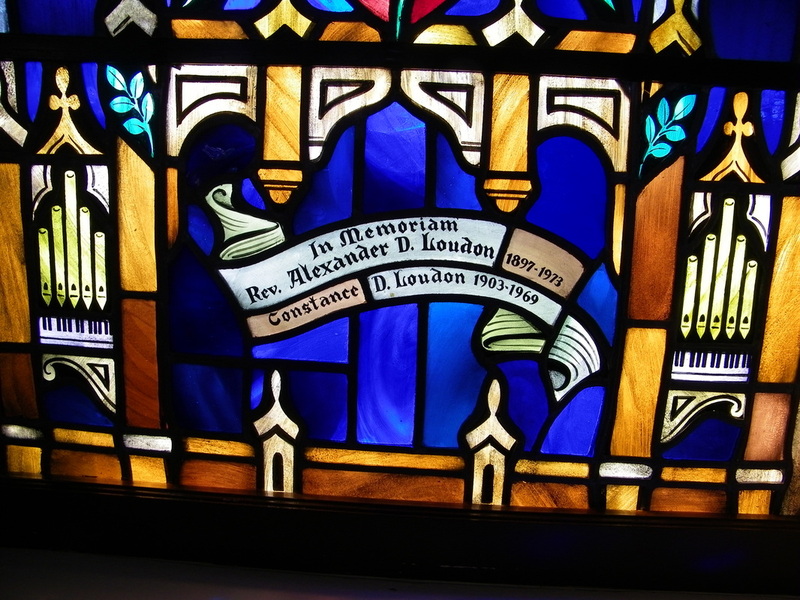 Alex Louden was a well respected pastor of the church. He was a member of the American Board of Commissioners for Foreign Missions and a member of the Maine Congregational Ministerial Relief Society. 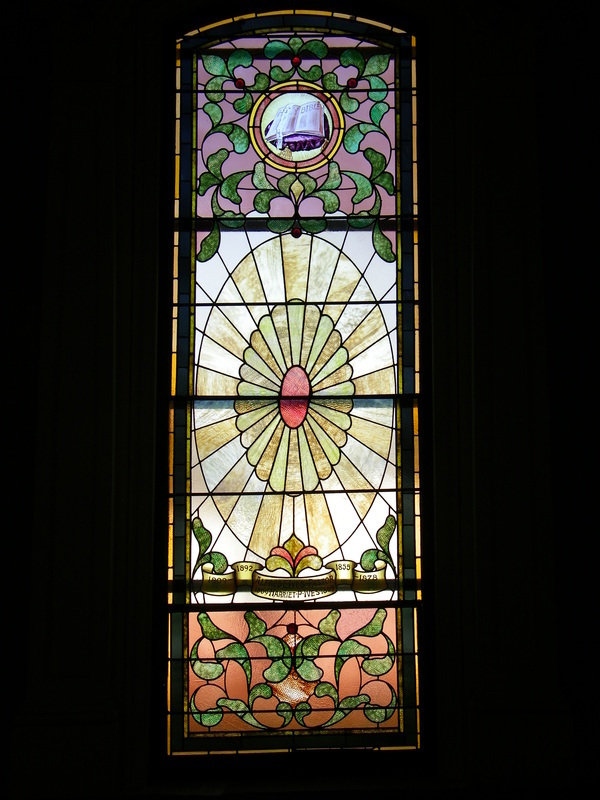 The Dr. Mary Cushman Circle had the window commissioned and it was installed shortly after his death in 1973. 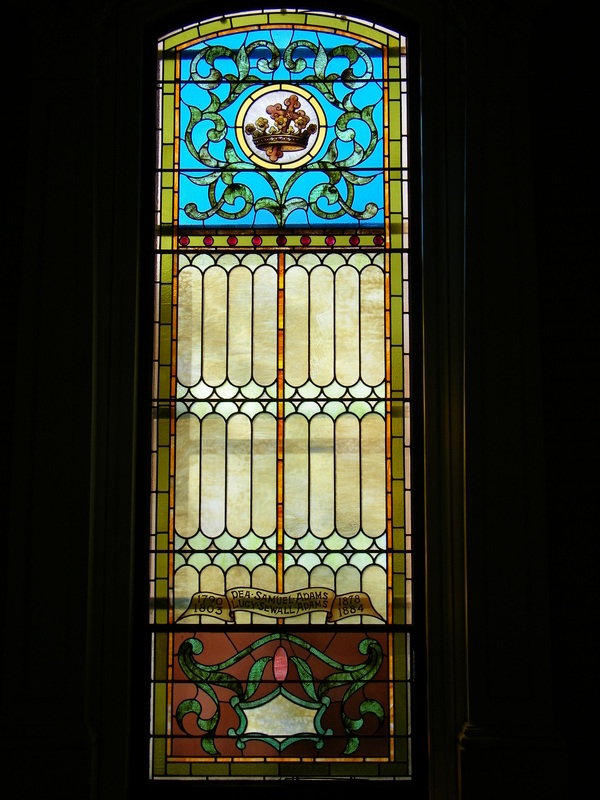 It was made by the Connick Studio of Boston, one of the last few windows made before the studio closed. 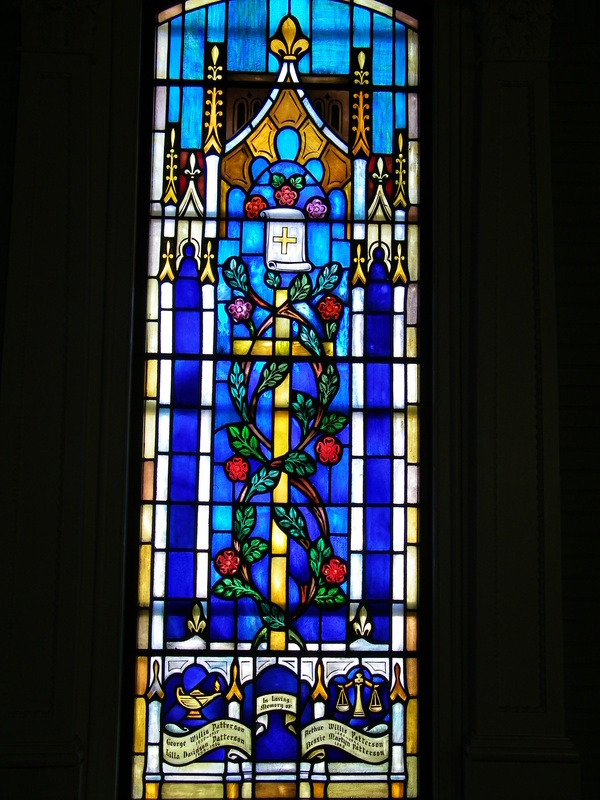 The design of the window was based on the "excellent comments" written by the Dr. Mary Cushman circle to help the studio design a window to reflect the church's devotion, including significant personal symbolism reflecting the Loudens' service. At either side of the scroll for the memorial text are organs suggesting Mrs. Louden's love of music and her activities in that field. 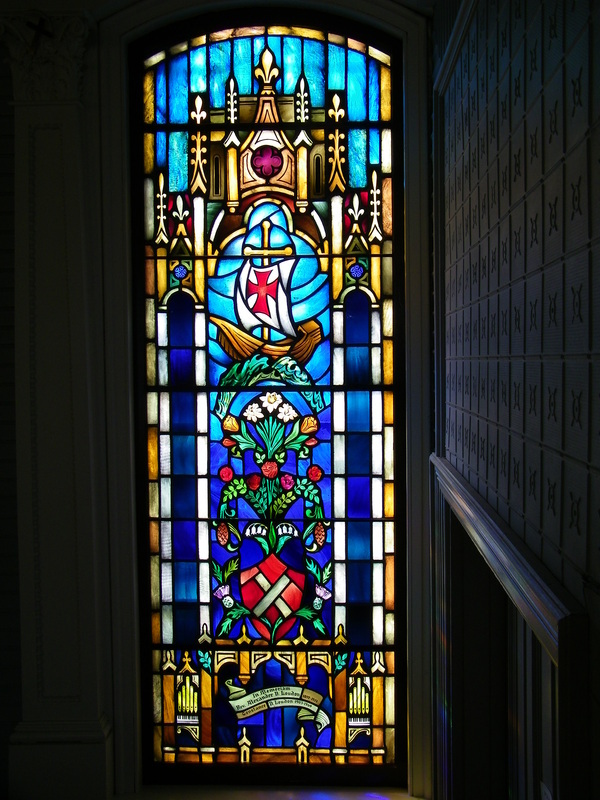 The shield above is inscribed with St. Andrew's Cross wreathed with thistles recalling Mr. Louden's Scottish origin. The flowers suggest his love of gardening, while the two pine cones represent the State of Maine. The dominant symbol above is the Ship of the Church, with the cross for the mast and again the inscription on the sail. This is an excellent symbol of dedicated devotion to the church and its steadfast progress through stormy seas. Dedication panel to the Louden window. Alfred E. Ives, husband of Harriet P. Ives, was installed as minister by the Council on June 20, 1855. He was paid $800 per year. Over eighty new members joined the church in the twenty plus years he was here. He was pastor until 1878. Rev. Ives liked poetry. He preferred John Greenleaf Whittier's poems over those of Henry Wadsworth Longfellow. He founded the Historical Society No. 2 in 1878. (Of the Historical Society No. 1, formed in 1865, there are no records). Ives was the president of the Society, and their one important objective was the uncovering of the old French Fort (Pentegoet) which yielded numerous relics and important information. The Sunday after President Abraham Lincoln was assassinated, Rev. Ives gave a sermon entitled "Victory turned into Morning: A Discourse on the Occasion of the Death of Abraham Lincoln, late president of the United States." It was well received, and published into a book. The sermon gives us an insight into the mind and heart of this church and the community after the Civil War. Rev. Ives' house still stands on the common above the Witherle Library and next to the Adams School. 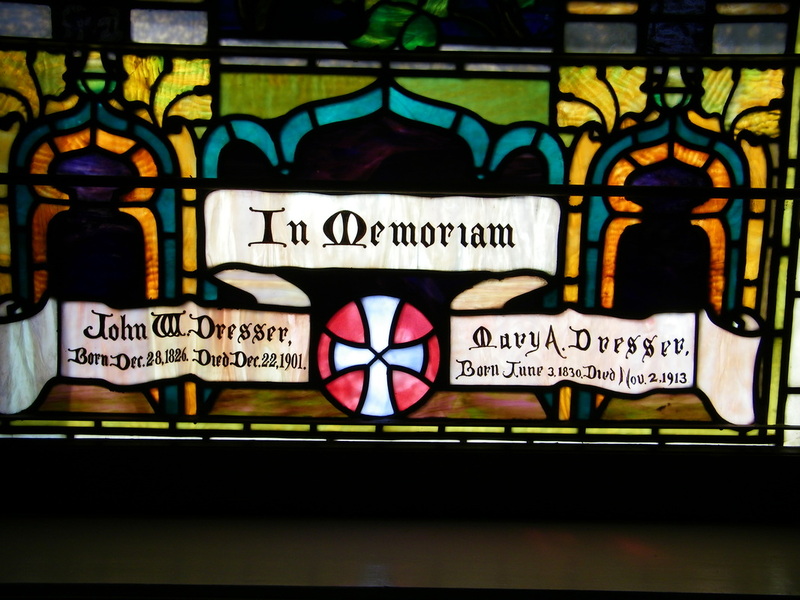 Dedication panel on the Ives window. Thomas Adams came to Castine in 1807 from Massachusetts, and became a merchant. He married Jane Russell of St. Andrews, New Brunswick, a granddaughter of John Perkins. He built the house that still stands on the corner of Court and Pleasant Streets. Thomas was one of the major merchants in town. During 1824 and 1815, when the British had possession of Castine, they established a customs house and collected duties on imported goods. After the war, the United States demanded another payment of those duties. The merchants refused to pay, and Thomas Adams, as one of the principal merchants, was named as defendant in the resulting lawsuit. The amount involved was about one hundred thousand dollars. Daniel Webster was the attorney for the defense, and won the case. Adams was also one of the primary stockholders and directors of the Castine Bank. It lasted five years and then failed. The United States bought the bank's interest in the building that housed it. It was then converted to the Customs House, and since 1919, the United States Post Office. As one of the key organizers of the church, Adams was the Superintendent of the Sunday School for 32 years. The Sabbath School was the result of his personal labors; his heart was warm and his prayers were fervent for his pupils. He loved them so much. Mr Adams was described as having a kindly face. It was noted that "He was extensively known and beloved as a man and a Christian. Those who partook of his kindness and shared his hospitality could not easily forget his manners and cordial welcome. His genial, winning ways must have effectively commended to many young minds the sacred truths he set before us." Prosperous as he was in the mercantile career, and blessed with worldly goods, he did not forget to offer upon the altar of God a large portion of his gifts. After the death of his wife in 1834, and due to ill health, Mr. Adams moved to Boston in 1837. 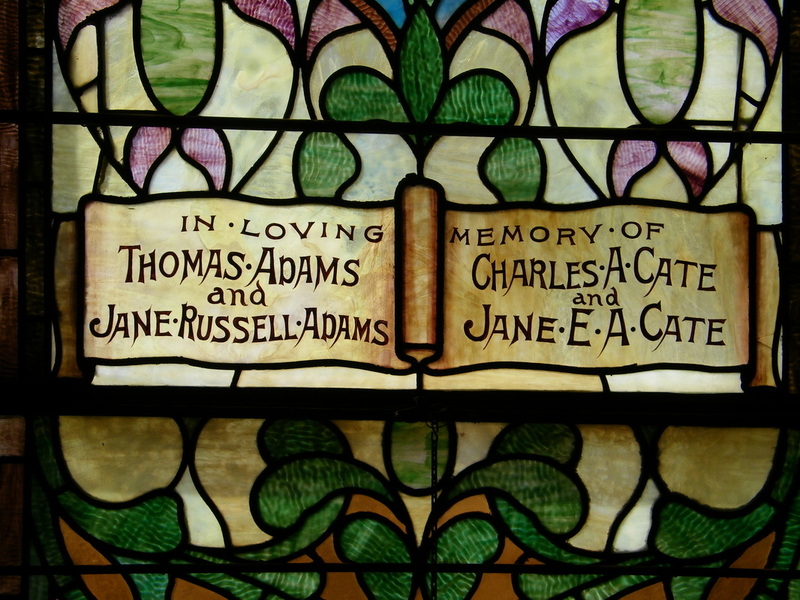 There, in Cambridge Mass, in the St. James Episcopal Church, is a stained glass window made by the famous John LaFarge and dedicated "In loving remembrance of Thomas and Jane Russell Adams of Castine, Maine and their daughter Ruth Reed Adams." 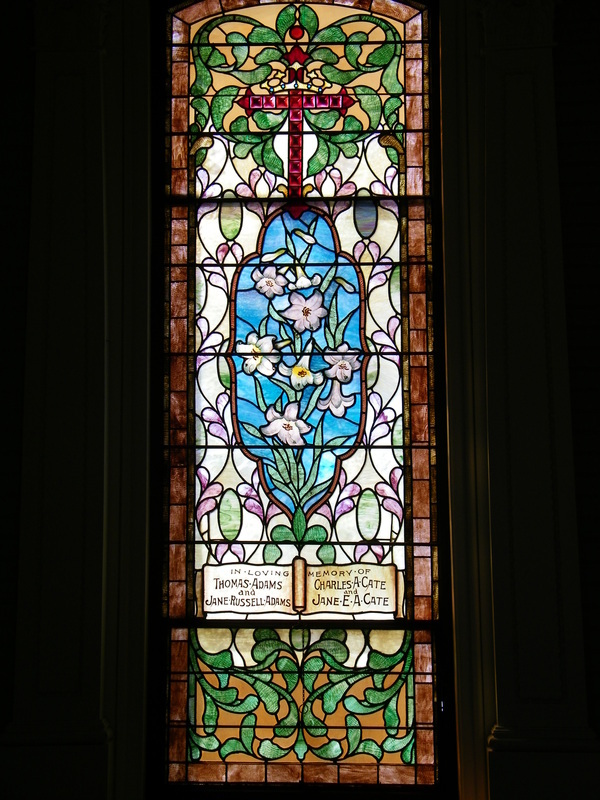 On the same stained glass window are the names of Charles Cate and Jane Elizabeth Cate. Jane is the daughter of Thomas and Jane Russell Adams. The younger Jane married Charles Cate. He had a general store, Cate and Whitting, at the foot of Green Street. He was a selectman for the town and Superintendent of the Library. He died leaving his widow with five children. She stayed on in the Adams house her father built. It is now known as the Adams Cate house. Their daughter, Anna Cate, went to Hawaii to help an uncle with his family and there met Sanford B. Dole. They later married in the family home in Castine. He became the only president and first governor of Hawaii. He was of the Dole family pineapple fortune. Dedication panel on the Adams window. Samuel Adams, born in 1790 in Pembroke, NH, came to Castine to work for his older brother (by seven years) Thomas in his store around 1809. He and his brother later joined in partnership. Samuel married Lucy Moulton of Bucksport, and they had six children together. The house they built and lived in is still on upper Main Street, the only house with a widow's walk. Samuel soon became a merchant on his own, and was involved in all phases of shipping, including owning, building, and outfitting ships. Where Dennett's Wharf is now was the old Adams Wharf. It came down through the family into the Dennett family by the marriage of a granddaughter. The Adams Store was a true general store, selling everything from diaper cloth to rum, camel hair to spyglasses, and ear horns for the hard of hearing. It was in the brick building on Water Street and Main (where the Union Trust Bank is now located). It sat in the middle of three store fronts. Samuel was also one of the founders of the Adams and the Abbott Schools. The Abbott school now houses the Castine Historical Society. Samuel presented the Eastern Maine Normal School with the bell that sits on the grounds of Maine Maritime Academy today. 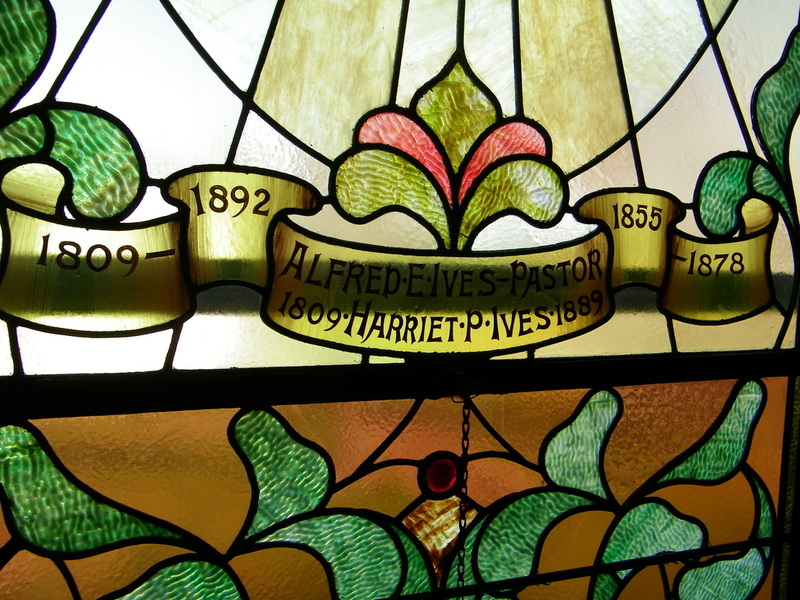 He was one of the original organizers of this church, and served as a deacon for 36 years. He held many important positions in town. In 1874, at age 84, he was described as "a hale old gentleman with all his faculties unimpaired -- cheered by the presence of his worthy wife and the companionship of his children and host of friends." He died in 1887 at the age of 88, and has a large monument in the Castine Cemetery. 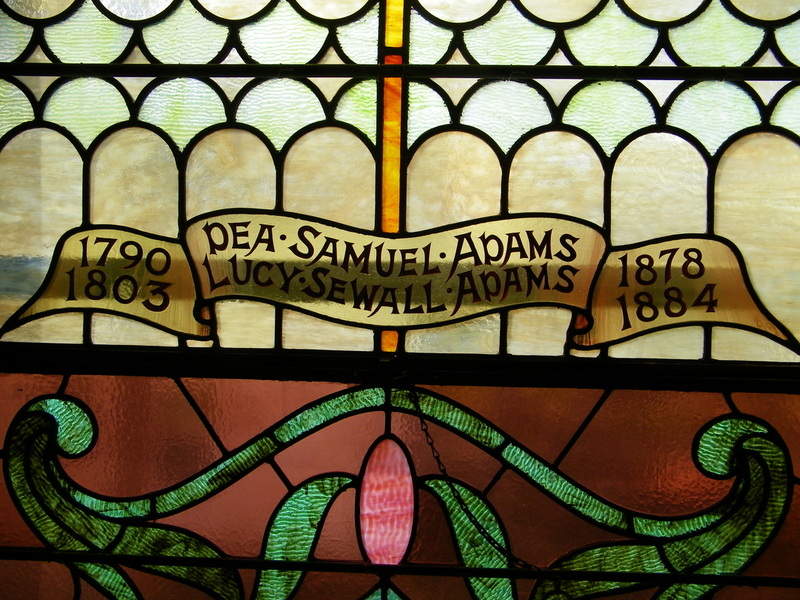 Dedication panel of the Samuel Adams window. Roliston Woodbury attended Bowdoin College but suspended his studies at the commencement of the great Civil War in order to enlist in the Fifth Maine Battery. It was recorded that he was "slightly" wounded at Gettysburg. He served until the end of the war. Instead of returning to Bowdoin he went to the Normal School in Farmington, Maine where, after graduation, he was retained as an instructor, later to become the assistant principal. In 1878 he was chosen principal of the State Normal School in Castine and continued to serve in that capacity until his untimely death in 1888. He was considered to possess "superabundant qualifications" as an educator, school director, and one of the most efficient preparatory teachers in the state. Bowdoin College conferred upon him the honorary degree of Master of Arts. In politics he acted with the Republican Party. 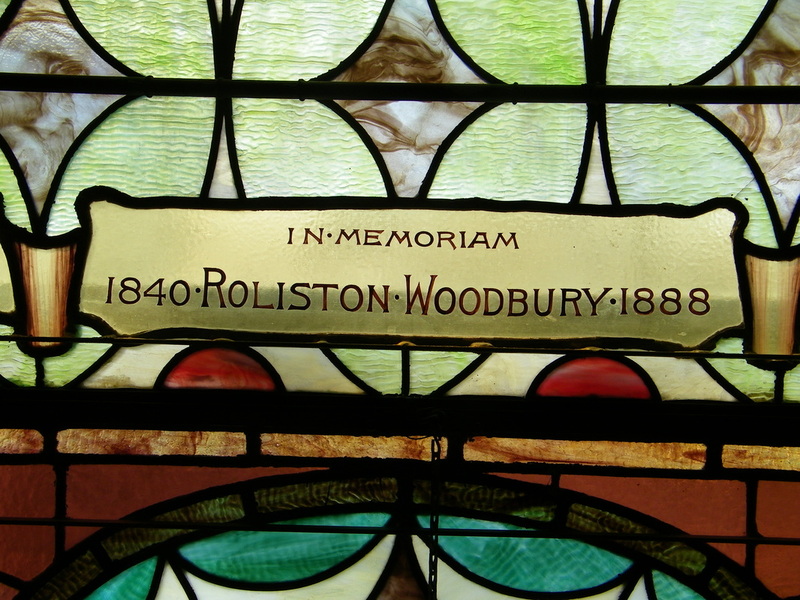 Mr. Woodbury was a member of this church and actively interested in religious work. He was married to Nellie Lovejoy of Albany, Maine. After her death he remarried Maria Billings of Fayette, Maine. He had three sons. John Wentworth Dresser was born and raised in Castine and married Mary Adams, daughter of Deacon Samuel and Lucy Adams in June of 1830. He was in business with his father, also John Dresser. They build a large rope walk on upper Pleasant Street where they made mackerel and cod line. The rope walk was the longest wooden building in Maine. Their business was well known all over the world. Young John also had a ship chandlery store. He made a comfortable fortune out of both the businesses and in 1900 he sold out to E. H. Carpenter. John W. Dresser was a member of the school committee, and taught singing at the Normal School for many years. He took an active interest in town affairs and this church. The Castine Centennial was celebrated on July 9, 1896. Castine was incorporated on February 8, 1796, but the celebration was held in July instead of February because "The weather in February is unusually inclement." The literary exercises were held in this church and John Dresser (among others) wrote a lengthy poem about the history of Castine and read it to the crowd. George Willis Patterson was installed as Minister in 1907 - 1915. He was well loved and with him the church grew. In February 1908 he formed a Shakespeare Club at his home. The object was to read aloud the plays, with each member being assigned a part by lot. Mr. Patterson was an authority on Shakespeare and remarkably well-versed in the plays. 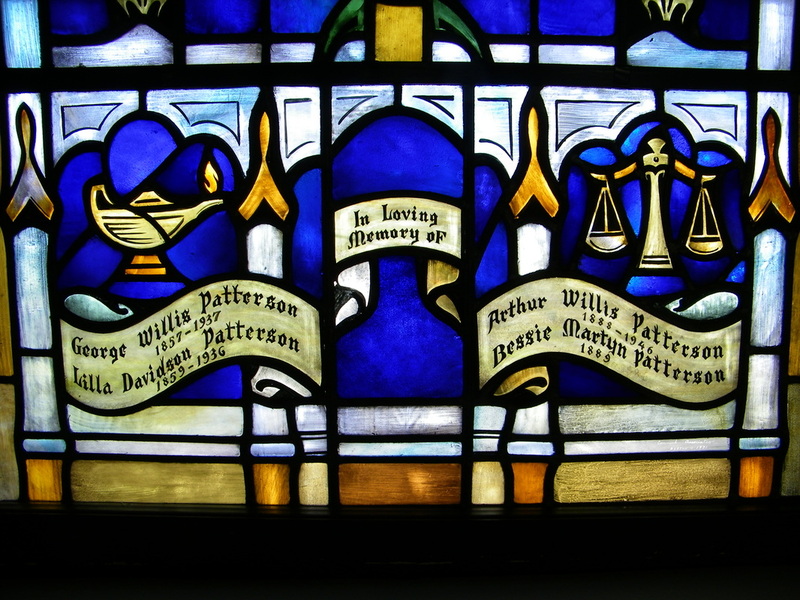 It was considered a great privilege to be a member of this club which continued as long as Mr. Patterson remained pastor of the Congregational church. He then went off to be connected with the "government war." The church then declined in membership, accelerated by the demoralizing influence of the first great world war. It became very difficult or impossible to secure supplies for the pulpit and a satisfactory pastor. The church, unable to sustain itself, became closed for considerable periods of time. 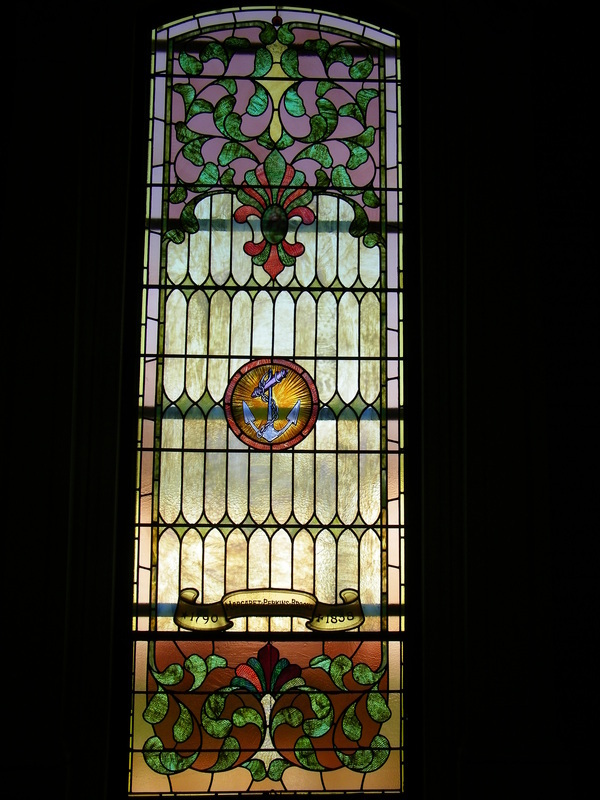 The window was installed by Donald and Gordon Patterson and their sister Margaret Patterson Willows, in memory of the Patterson family. 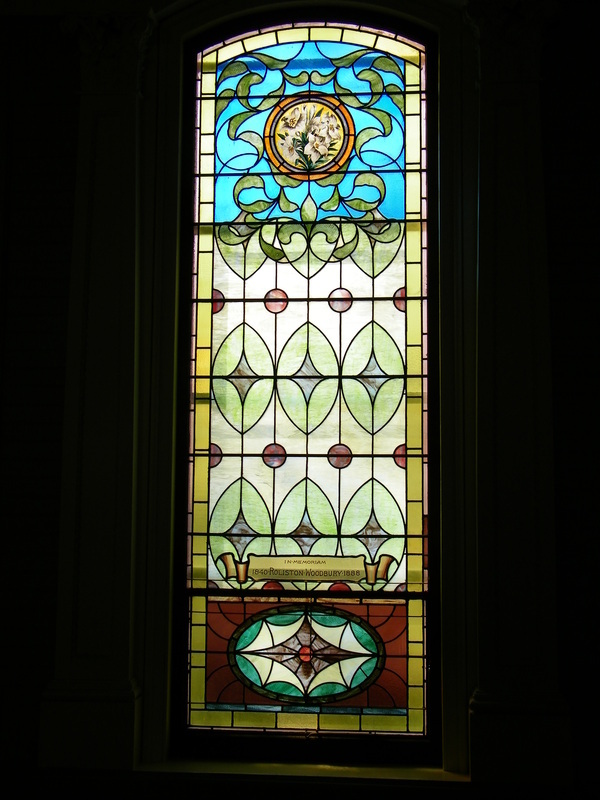 The window was made by the famous Connick studio (now closed) in Boston and installed in 1971.